West Bengal Government is going to provide 5 lakh houses to the poor people in rural areas under Bangla Gramin Abas Yojana. Subsequently, govt. will provide houses – Banglar Bari (homes) to the people in the rural belt. 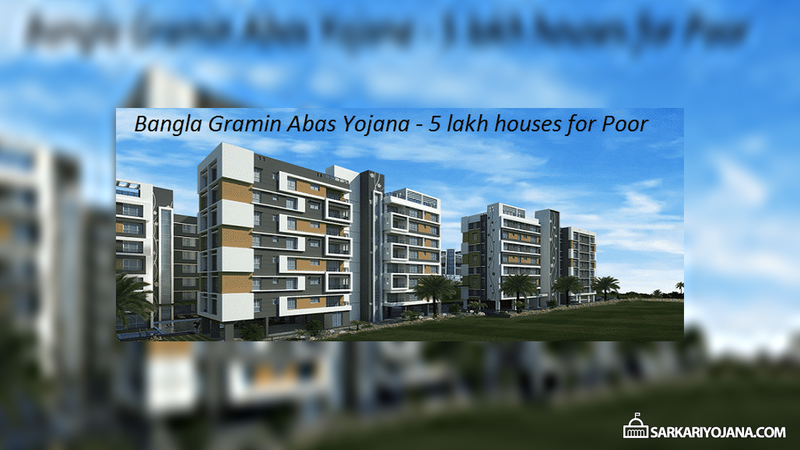 Accordingly, Bangla Gramin Abas yojana is a part of the Pradhan Mantri Gramin Awas Yojana in West Bengal. Govt. will hand over these houses to the people on 29 January 2018. Moreover, govt. will also provide financial assistance to build houses to other 3 lakh people under the “Geetanjali Scheme”. West Bengal CM announces to distribute these houses to the 5 lakh households before the Panchayat elections scheduled to take place this year. Furthermore, WB govt. is going to distribute sanction certificates to beneficiaries on “Banglar Awas Bitaran Divas”. At the inauguration function of “Mati Utsav” which is a soil festival to promote farm sector, Cm made this announcement. Under this housing scheme, all the people belonging to the poor and economically weaker sections of the rural areas will get houses. The state govt. of WB will provide these houses to the 5 lakh economically weaker and homeless families on 29 January 2018 across various districts under Bangla Gramin Awas Yojana. Moreover, people having their own plot will also receive financial assistance for purpose of construction of houses under “Nijo Bhumi Nijo Griha” scheme. Under this Banglar Bari Scheme, people living below the poverty line in various municipalities will get immense help. State Urban Development Agency (SUDA) will construct these flats for the poor people. Moreover, women run families (headed by women) and financially weaker ones, whose family income from all sources is less than Rs. 10,000 p.m will get priority. WB govt. has returned the land which was taken away forcibly in Singur to its owners. Owners now harvest golden paddy on these lands. Subsequently, govt. also insures about 21 lakh hectares of agricultural land under the insurance scheme. In addition to this, govt. will provide bravery awards to the girls who have foiled around 120 child marriages under Kanyashree Prakalpa. Moreover, the state govt. is going to provide compensation of Rs. 1200 crore to 30 lakh farmers and households which get affected through recent floods. Govt. also distributes approx. 79 lakh Kisan Credit Cards (KCC) to the farmers. Furthermore, state govt. will also provide Rs. 2,768 crore to bring more crop area under irrigation. Furthermore, people will receive assistance for building pucca houses in urban areas Geetanjali scheme. How to apply on PMAY-G and Bangla Gramin Abas Yojana??? How to apply abas yozana. Sir,i am indu prasad,who belongs to a poor family & huge all responsibility of my family.we have 5 members in my family, all are women.i have no any male person in my family. please allot me a small house.my add is 23/1/H/8 pottery rd.kolkata 700015.po Tangra. I have not any house in west bengal. I want to make a home for my family. I am working as an accountant in private Jute industry. So please feed back in supported by government. ”I m sri pranab saha a poor,needy and homeless man of the village of nakkatigachh, P.O-Dwiperper,P.S-Tufanganj,Dist-Coochbihar, State-West Bengal, Pin code-736159.So I want the assistant for built the house under the pradhan awas yojana gramin /bangla gramin awas yojana. I’m Sri Pranab Das, a poor man of the village of Khanyadihi, P.O- Khanyadihi,P.S-Kolaghat, Dist-Purba Medinipur,State-West Bengal,PIN Code-721641.So I want the assistant for built the house under the Prahran mantra awas yojana Garmin / bangla gramin awas yojana. Kindly advise us how to apply for this benefits.My self Sayan Mondal I was leaved from Raharhati po-kholapota Basirhat-2 also my mother.We are very poor and also nt able to make home so we exceeding need it,if it would be wrong so kindly verifyed us. I ll request to you organise this project without any political disturbance . Please understand me and help us …..
I”m sri Santosh Murmu a poor,needy and homeless man of the village of Saparambera, P.O-Ajodhya,P.S-Baghmundi,Dist-Purulia, State-West Bengal, Pin code-723152.So I want the assistant for built the house under the pradhan awas yojana gramin /bangla gramin awas yojana. I’m Sri Santosh Murmu a poor,needy and homeless man of the village of Saparambera, P.O-Ajodhya,P.S-Baghmundi, Dist-Purulia,State-West Bengal,PIN Code-723152.So I want the assistant for built the house under the Prahran mantra awas yojana Garmin / bangla gramin awas yojana. I am poor man my address 130,rr plot ,anandapur,ektp,kolkata-700107.ph 8617239051.please allotment my small house. Iam a very poor & Needy person.plz Approve House of Bangla Bari (House).